Do you hate to cook? 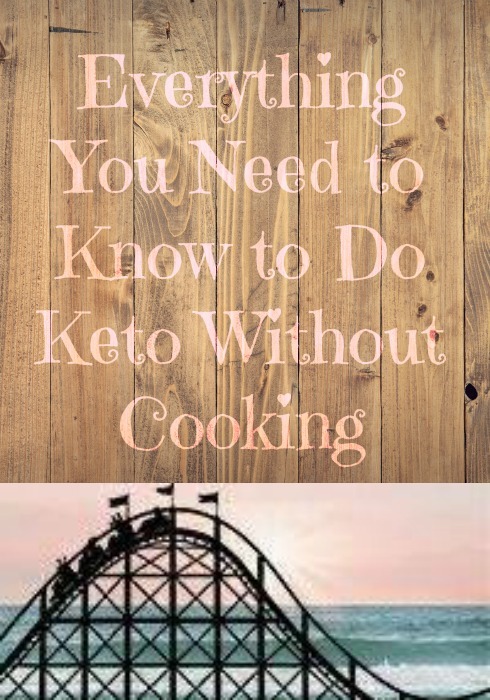 If you’d rather do almost anything than spend a lot time stuck in the kitchen, you’ll be thrilled to know there are ways to be successful on keto without cooking. Today I’m going to share some hacks that will keep you on the keto path without spending hours in front of a stove. For the purposes of this list, “cooking” will be defined as anything you can’t do in a microwave. Heat & serve keto meals. This may sound obvious, but finding keto-friendly frozen meals aren’t as easy as you might think. It may surprise you to know that plenty of those “healthy” meals in the freezer section are often loaded with sugar and carbs. Lots of them have fillers of rice or potatoes, which of course is a no-no when you’re cutting carbs. Always look at the ingredients list for grams of sugar and net carbs. Remember, to find the net carbs of a food, subtract the fiber and sugar alcohols from the total carbs. You may want to try a brand called Realgood, which has a cult following in the keto community. They offer everything from pizza to enchiladas and are sold in grocery stores across the United States. I tried the Pepperoni Pizza and it was “real good”. Would definitely try it again for a quick meal alternative. Simple lunch meat rollups. My two favorites are ham and dill pickle spears and turkey breast and bacon. I’ve seen some people spread cream cheese on them before rolling them up, but I don’t do that because I’ve never been a huge cream cheese fan. Grocery store salad bars. Salad bars can be a minefield when you’re doing keto, but if you’re careful you can grab a great meal for yourself. For example, fill up with romaine topped with eggs, avocados, chicken, cheese, and bacon. Worried about the dressing? You don’t have to be. Believe it or not, regular Ranch dressing only has about 2 carbs per serving. So long as you don’t pour it over your salad with abandon, you’ll be fine. Shakes. Meal replacement shakes can be such a wonderful staple for folks on keto because of the amount of protein they offer. Having said that, most of them have too many carbs. Like everything else, scour the ingredients before you purchase them. Atkins makes great protein shakes in several flavors and they are totally yummy. Pro tip: the colder meal replacement shakes are, the better they taste. Rotisserie chicken. Stop by your local grocery store and pick up a beautiful rotisserie chicken. Depending on how many people are eating, one chicken can easily make several meals. When you’ve pulled off all the meat, boil the rest and freeze the broth for a time when you do feel like cooking. Canned tuna & salmon. If you are a fan, tuna and salmon are a fantastic staple to keep in your cupboards. StarKist makes a large variety of seasoned tuna in single-serve pouches which are packed with protein and are less than 100 calories. Eat them straight out of the pouch, or add some mayo and a boiled egg and you have a quick, protein-packed meal. Bacon & eggs. They’re not just for breakfast. Bacon & eggs are good any time of day. The great thing here is that you can buy pre-cooked bacon and it’s actually pretty good. You’ll usually find it near the refrigerated bacon. All you have to do is pop it in the microwave. You can even cook bacon in the microwave. I cook mine for 3 1/2 to 4 minutes and it’s perfect. You can microwave eggs as well. Mix together an egg and a TBSP of milk in a microwave-safe bowl and set the timer for about 45 seconds. Take it out, fluff with a fork, and pop it back in for another 30 seconds and you’re good to go. Add some cheese and you have a smart, protein-packed keto meal. Intermittent Fasting. If you truly hate to cook, learn to incorporate intermittent fasting into your daily routine. It doesn’t mean you have to go days without eating. It doesn’t even have to mean that you go an entire day without eating. When you are doing intermittent fasting, you simply go without food for 12 – 16 hours in a 24 hour period. Before you decide that’s too hard for you to try, remember that you’re asleep for at least half or more of those hours. If the last thing you eat is at 6 PM, for example, don’t eat again until the next day at 6 AM or if you can make it, 10 AM. Intermittent fasting has a lot of health benefits and it’s really not hard to do, especially if you make sure you’re eating enough protein. You can learn more about intermittent fasting here. Those are my best tips to do keto without cooking. Do you think some of those could work for you? If I’ve missed a great tip or a delicious, no-cook food that is keto-friendly, I’d love it if you’d share.